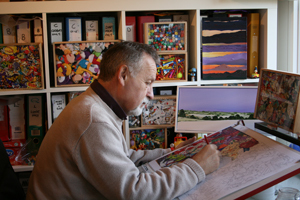 I work from my studio in Harwell Village, Oxfordshire where I paint, print, draw and teach. I have a BA (Hons.) in Fine Art and an MA in Art Education as well as a PGCE in Art and Design. I work in a variety of media, but as a member of the UK Colour Pencil Society I especially enjoy using this medium to create my ever-growing 'Squashed' series of drawings. I exhibit regularly but also welcome visitors to my studio where other paintings and work in progress can be both viewed and purchased.